Kissimmee, Fla. – When you’ve been as successful as the Boston Wolfpack have at national MSBL tournaments, it’s no wonder their name precedes them. The Holiday Classic at Disney, played at the ESPN Wide World of Sports complex, was no different. Dominating the competition once again, the Wolfpack posted a perfect 6-0 record for the week, outscoring the opposition 64-13 en route to a 7-3 championship game victory. 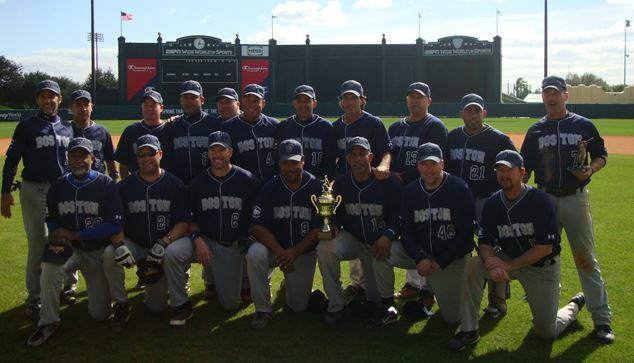 The title was Boston’s third straight at Disney and the victory over the Birmingham Yankees was its 26th consecutive at the tournament. The Wolfpack’s 12-year record at the tournament now stands at 56-7. Still, there’s no secret formula for the team’s success. After Edgardo Mercado’s one-hit, seven strike out, complete-game performance and a five-run fifth inning propelled the Wolfpack to a dominating 11-0 semifinal victory over the San Antonio Reds, Wolf gave the ball to Sean O’Connor in the championship game. It was a wise move. O’Connor helped hold Birmingham to seven hits, while another five-run inning – this time in the second – broke open a scoreless game and paved the way to victory. Unlike other games when Boston’s power was the difference, in the final, the Wolfpack used a bit of small ball to dishearten the Yankees, who finished round-robin play 3-1 before defeating the Bethlehem (KY) Stars, 6-4 and the Jacksonville Vikings, 8-7 in the playoffs. Scott McSparen pitched the final two innings of the victory over the Stars to earn the save, then tossed a complete game in the semifinal for 11 consecutive innings pitched. He was backed by a pair of Sean Moran triples, but the Yankees’ run was ended in the finals when Boston used a walk, three consecutive bunt singles and Miguel Franquiz’s RBI triple to take a 5-0, second-inning lead. Birmingham got a run back in the third when Clete Walker scored and two more in the fifth on a Moran single, but was never able to mount a serious comeback. Marc Texiera drove in Robert Iandoli with a run-scoring hit in the fourth and German Rivera added an insurance run in the eighth to close out the scoring. Russ Ward, a veteran of numerous national tournaments with the Wolfpack during the past 12 years, was “an easy choice for MVP,” Wolf said. Ward had 16 hits entering the title game and was once again an offensive catalyst throughout the tournament from the third spot in the batting order. WP – O’Connor (1-0); LP – Coburn (0-1). Hitting: (Y) Flutie 2-4; Franquiz 3B; Hoyt 2-4, R; Iandoli 2-4, 2R. (W) Moran 2-4 2 RBI; Walker 1-4, R; Alfano 1-3, R; Sibeto 1-3, R.
The Birmingham Yankees were 3-1 in round robin play and won two playoff games before losing in the finals.